While assisting in local agriculture and community development, the Eldridge family decided to use a common commodity, coffee wood, in the Honduran village of Las Lomitas, to start a business and further their mission in driving area community growth. 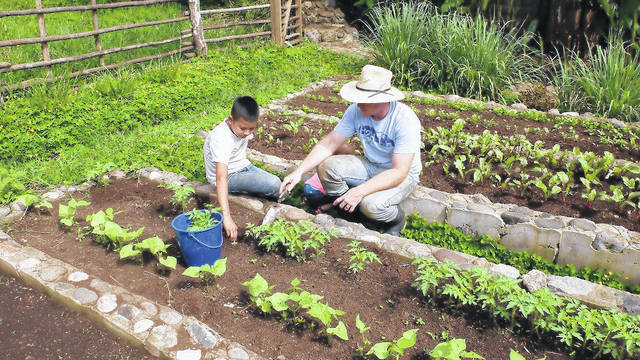 LAS LOMITAS, Honduras — Gallia County has a history of producing individuals who sought to uplift others out of tough conditions and while Kaleb Eldridge and his wife Stacey don’t live in the U.S. anymore, they are continuing that tradition in Honduras. Kaleb said he grew up in Bidwell. His father works in the electricity and power transfer industry and his mother is a teacher. Stacey and Kaleb met at Cedarville University and married in 2009 before moving to Honduras and have been living in a coffee-producing town named Las Lomitas. The pair work with a nonprofit, faith-based group called Heart to Honduras which seeks to empower local community members. Kaleb and his wife focus in community development and assist residents in “getting back on their feet,” he said, and becoming independent in going about their lives again. The pair’s efforts focus in sustainable development. Hurricane Mitch in 1998 left Honduras in a rough situation, according to Kaleb. Thousands lost their lives and homes. He said much of Honduras is still recuperating. Kaleb said according to his department with Heart to Honduras and its figures, 95 percent of project costs and labor it has taken part with were executed by ties to the U.S. Local involvement was around five percent. The percent of local involvement has risen over the last six years to 43 percent. The group works with a few dozen communities. “It’s not the goal but it’s higher than what it was,” said Kaleb. Along with their work in Heart to Honduras, the pair started a business called de Palo, apart from the nonprofit. De Palo is recognized as a high quality coffee in Honduras. Kaleb said he was working on a project before the de Palo business was started and was driving a stake made of coffee wood into the ground as part of construction efforts. He noticed the wood was extremely hard and asked from what plant it originated. Eventually, the Eldridges would pair with area carpenter and pastor Eduar Funez to start creating products made from coffee wood and sell them. Coffee plant trunks tend to be thin but are recognized for being durable and hard and have been often used for tools in the area. The business within the last few years launched a Kickstarter campaign which led to around $12,000 of orders for de Palo products as a means of “getting it off the ground,” said Kaleb. Currently, the business sells scooping utensils, pour-over stands and coasters and looks to employ Honduran residents. For more information about Heart to Honduras, visit www.hth.org. For more information about de Palo, visit www.depaloproducts.com.